I've been working a lot lately. And I have to commute pretty far, so I really appreciate every dollar I earn. So it's that much more important to me where I spend my dollars. I want to make sure that I am supporting companies that have a passion and a goal to not only sell a cool, useful, or tasty product, but to make the world a better place in the process. I also want to try to support local business whenever possible, so I am excited to pimp out these 2 local SoCal upstarts, who do just that. Sugar Beets Bakery, in Chino, is a gluten free vegan bakery that is outta this world. Gina is a master in the kitchen and bakes up gf goodies that are so moist and gooey and delicious you would never guess they were wheat free. She has recently opened up her doors for walk in business on Thursdays an Sundays. I was there this morning and got 2 boxes full of ahhhh-mazing goodies. Donuts, cookies, cupcakes and brownies to be exact. (I foresee many extra miles to be run this week to make up for it, too!) Visit her website for hours, menus, and more information. 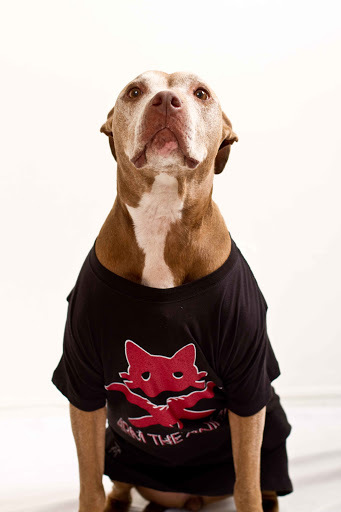 Arm the Animals, out of Long Beach is a T-shirt company with a simple mission. Provide financial support to struggling no-kill animal shelters. The shirts are really cute too. Lots of colors and fun designs that make a statement. Check out their website for more info or to check out where they'll be setting up shop next. Love the Arm the Animals site. My dogs are rescues and I firmly believe in saving animals. When I see abuse (chaining dogs up in the glaring sun in 100º heat with no chance for shade or in sub-zero temperatures in a blizzard ... and yes, I've seen both), I call the Human Society and report them. There is absolutely no excuse for animal abuse. That dog is adorable. Even if I didn't read the description of the mission of the company, I'd be sold on that photo alone. I grew up in SoCal and don't remember it being so veg-friendly, but more and more places seem to be popping up every time I visit -- love it! Thanks for sharing the info. Anyone looking for the support of our bad credit problems? The most common problem we all face during our manhood? I would surely recommend this Website to everyone! I am really surprised how great life insurance services they offer at very affordable prices! Such amazing and decent proposals! I would like to recommend http://leaveassurance.com to everyone! They are perfect in their work! Amazing post I really liked the CEO, very down to earth and understanding. Was willing to help whenever you needed it. Everyone there is willing to help you grow, and pushed you to do your best. It feels so sad after reaching to these types of problems we are facing financially! I would like to suggest Cash to every one of you who are suffering from these types of tragedies! Anyone, looking for the most desirable promotional classes for your business? Don’t waste anymore of your time check out the tax preparation port st lucie here! And I assure you! You will not regret it. It feels so sad after reaching to these types of problems we are facing financially! I would like to suggest Saving to every one of you who are suffering from these types of tragedies! I'm here! Let's get the party started!